Everyone loves receiving our glow in the dark grippy socks. Not only are they extremely fun and good - your guests can dance the night away in comfort! The words and design are actually non-stick treads - so no slipping when wearing them. 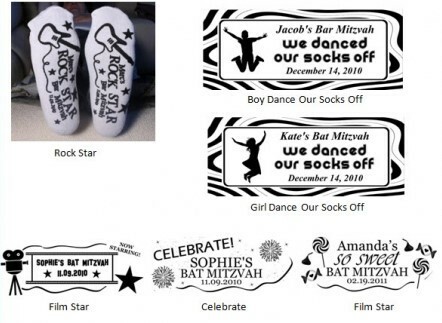 Grippy socks are the one-size-fits-all terry-knit socks that have the ink treads on them; they are also known as personalized dance socks. Depending on the size of the child or adult, they come up to the top of the ankle or a few inches above (these are not below the ankle socks. These are sold in SETS OF 48 pairs of socks. 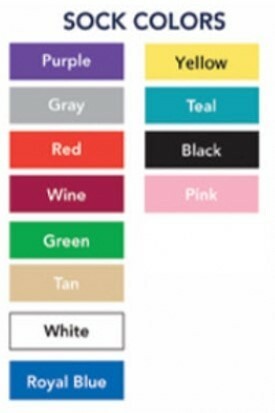 Please note that their are no ink color choices available for our glow in the dark socks. They are printed with a white ink. Our regular Grippy Socks come in a variety of sock and ink colors. You will receive your glow in the dark party favors order approximately 3 weeks after you submit your order.